Zion Market Research has published a new report titled “Global Anti-Jamming Market for GPS by Technique (Nulling System, Beam Steering System, and Civilian System), by Application (Flight Control, Surveillance & Reconnaissance, Position, Navigation & Timing, Targeting, Casualty Evacuation, and Others), and by End Users (Military and Civilian Anti-Jamming Systems): Global Industry Perspective, Comprehensive Analysis, and Forecast, 2017 – 2024”. 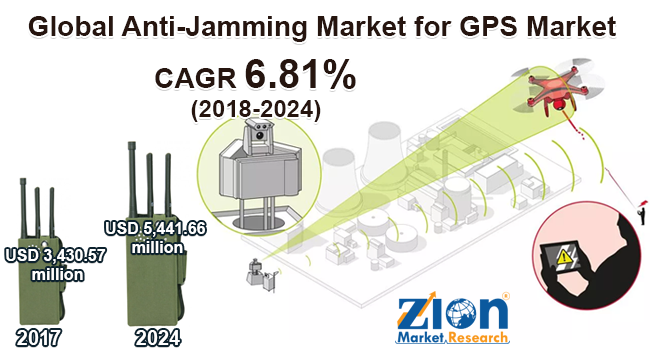 According to the report, global anti-jamming market for GPS was valued USD 3,430.57 million in 2017 and is expected to reach around USD 5,441.66 million by 2024, growing at a CAGR of approximately 6.81% for the forecast period from 2018 to 2024. In terms of volume, the market is predicted to reach around 380.17 thousand units by 2024. Global positioning system (GPS) has been extensively used worldwide for a variety of applications such as air, land, and sea. GPS has become one of the crucial sources of information with significant economic benefits which makes it increasingly important. GPS boosts productivity in several sectors including civil safety response, law enforcement, farming, mining, surveying, and package delivery, among others. Rising use of GPS anti-jamming technology in different industries such as military, aerospace, and civilian is giving traction to the anti-jamming market for GPS. GPS anti-jam technology is basically used in flight control, surveillance & reconnaissance, position navigation & timing, and targeting applications. GPS has become essential to nearly all military operations and weapon systems. Hostile jammers severely impact navigation capabilities of armed forces. There is the increased vulnerability of GPS signals owing to the development of low-cost jammers. Thus, the introduction of low-cost jammer and their easy availability is one of the major driving factors for the growth of the anti-jamming market for GPS. Rising intrusions of GPS signals owing to the easy availability of the low-cost jamming system for GPS and ongoing developments to enhance the overall GPS infrastructure are further supporting the demand for GPS anti-jamming systems. However, availability of Precision Terrain in Aided Navigation (PTAN) as a substitute for anti-jammer is restraining the growth of this market. Furthermore, increasing usage of GPS anti-jamming in airborne unmanned systems has a good opportunity for the global anti-jamming market for GPS. On the basis of technique, the global anti-jamming market for GPS is segmented into nulling systems, beam steering systems, and civilian systems. Nulling system techniques anticipate holding the largest size in terms of revenue, by 2024. Based on application, the global anti-jamming market for GPS is segmented into surveillance & reconnaissance, casualty evacuation, position, navigation & timing, flight control, targeting, and others. Military and civilian anti-jamming systems are the end-user segment of the global anti-jamming market. On the basis of regions, the global anti-jamming market for GPS is segmented into the Asia Pacific, the Middle East and Africa, North America, Latin America, and Europe with its further bifurcation into the U.S., UK, Germany, France, China, India, Japan, and Brazil. In terms of revenue, North America held the largest market share for the global anti-jamming market for GPS in 2017. The dominance of North America is expected to grow in the forecast period due to the growing reliance on satellite communication for various military operations. The Asia Pacific is expected to have significant growth in the years to come owing to strong demand from emerging countries such as China, India, Japan, and South Korea. Brazil is expected to show remarkable growth due to its dominance in the UAV market in Latin America. The Middle East & Africa is expected to show a moderate growth in the years to come. The major players in the global anti-jamming market for GPS are Novatel Inc., Cobham Plc, BAE Systems Plc, Thales Group, Lockheed Martin, The Boeing, Harris Corporation, Rockwell Collins, and The Raytheon Company, amongst others.